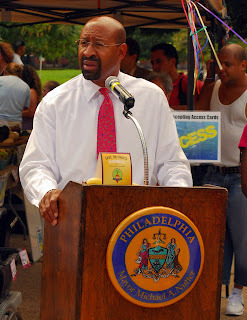 The Philly Food Feed Farmers' Market Marathon continued on Thursday and we turned into "Johnny on the Spot" at the grand opening of the Norris Square Park Farmers' Market on the corner of Susquehanna and Howard Streets in North Philadelphia. This market is the second of ten new markets the City of Philadelphia is slated to open over the next two years, in partnership with The Food Trust and the Department of Health and Human Services (HHS). In an effort to provide fresh foods to low-income areas of the city, the HHS is providing a 15 million dollar grant from their Communities Putting Prevention to Work initiative derived from a 650 million dollar, American Recovery and Reinvestment Act allotment. The idea here is that by increasing access to healthy foods in low-income communities, the obesity prevalence and chronic diseases that plague these communities will decrease. While the noble aspects of this plan have to be admired, fighting obesity now costs less money than having to fight it later with health care dollars. During this "Marathon", I have visited parts of the city that I usually don't frequent and it really makes me appreciate the access I have to healthy food. I have never lived in a place where I could not walk to get an apple, even if it wasn't organic. Even with that, I still have diabetes and there is no doubt it is weight related. Moreover, I only know what I know now through my own research and advanced age. 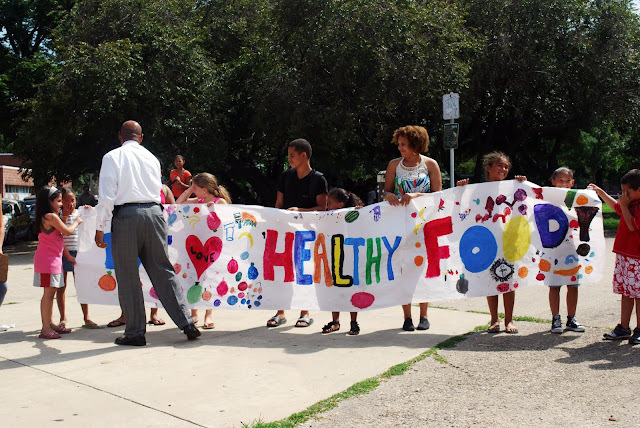 Advanced at least over some of the children who gathered at the opening to profess their love for healthy food. They need more fruit options than Tahitian Treat or they will be checking their blood sugar three times a day by their thirties. The vendor on hand, Solly Farm, showcased some beautiful fruits and vegetables and definitely proved themselves worthy of the auspicious occasion. Among their wares I spotted peaches, apples, eggplant, strawberries (still?) and onions. It is their fruit you see as the new blog background. Wow, what a prestigious distinction for them. Somebody be sure to let them know. A special shout-out has to go to The Food Trust for managing the entire affair. One didn't have to look far to see one of their smiling faces assisting the farmers or the customers or anybody else who might have had a question. It was crowded and hot but I didn't see any of them break a sweat. Well, it was pretty hot so I'm sure they did, whether or not I actually saw it. I know Ethan was sweating, but overall he was a very good boy. The whole affair went off without a hitch (unless you count the Mayor taking over decoration detail from the wind), and you could definitely tell that everyone was having fun, a welcome by-product of the spread of healthy food. Speaking of the spread of healthy food, there is another program promoting access to fresh produce I wanted to highlight. 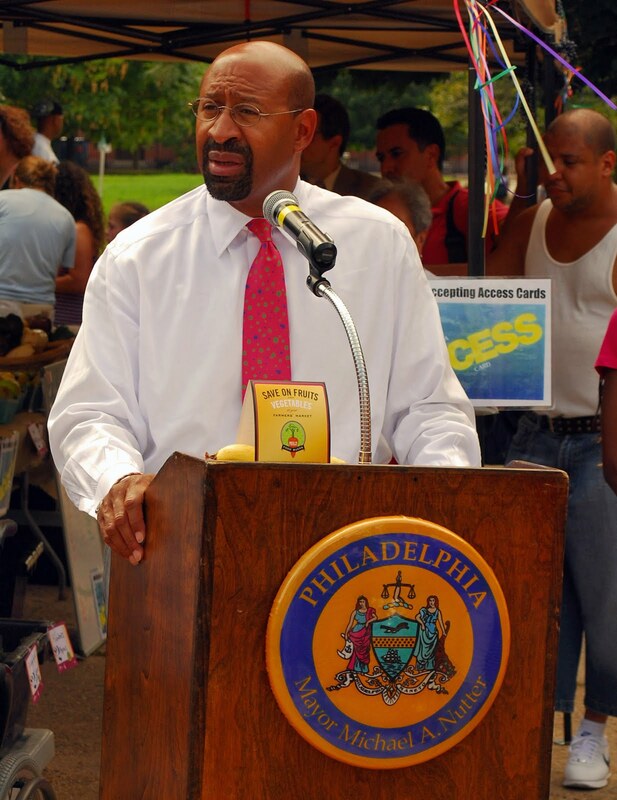 The Philly Food Bucks Program, a joint effort of The Food Trust (again!) and the Philadelphia Department of Health, should motivate those receiving SNAP/food stamps benefits to really get in on the fresh food fun. 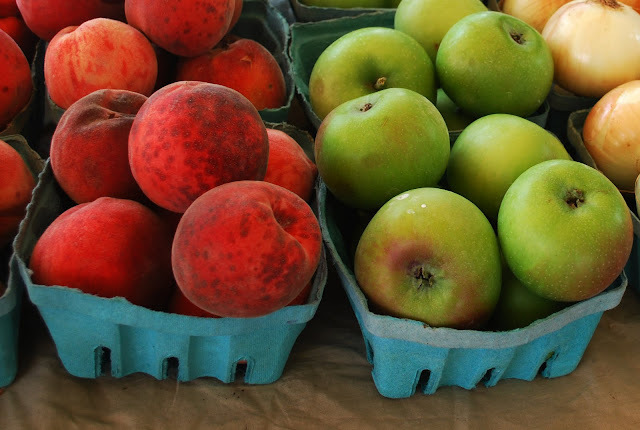 For every five dollars they spend in SNAP/food stamps benefits at a participating farmers' market, they will receive two dollars in Philly Food Bucks to spend at any other SNAP participating farmers' market. Here is a list of said markets. What a fine idea; more investment in communities rather than in insurance companies. I also like the name. Thanks for coming to the grand opening. It a wonderful tribute to a new market. Too many people don't know about the Norris Square neighborhood, or they think wrongly about it. Norris Square is a vibrant, friendly, safe neighborhood and the farmers' market will add even more dynamics to that part of the city. Thanks, Ben. Good writing too. Thanks Jon! There is no reason this market shouldn't be a success. Great coverage, Ben! A lot of great information on the growth of farmers' markets in the Philadelphia area particularly to support low-income neighborhoods. 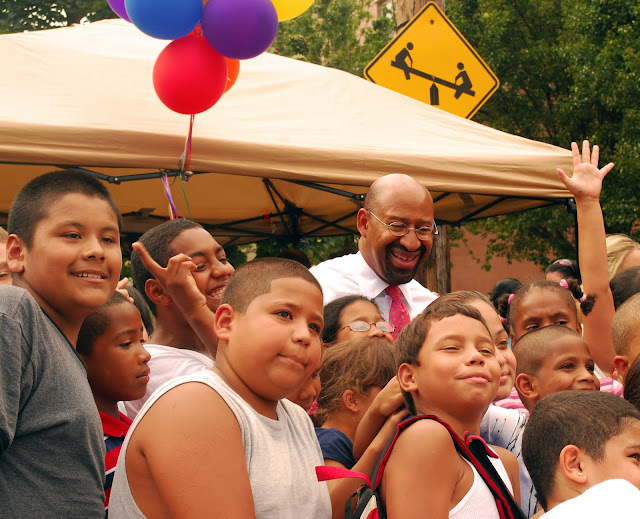 First time I've read about the Philly Food Bucks program - thanks for raising awareness. I liked your statement about fun being a welcome by-product of the spread of healthy food.